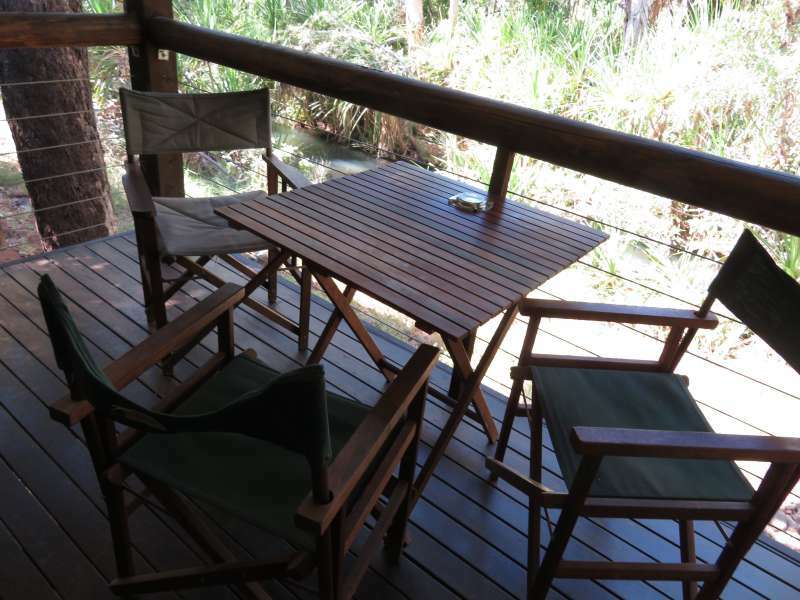 The Travelling Lindfields: El Questro Station Bungalows: The best kept secret in the Kimberley. El Questro Station Bungalows: The best kept secret in the Kimberley. 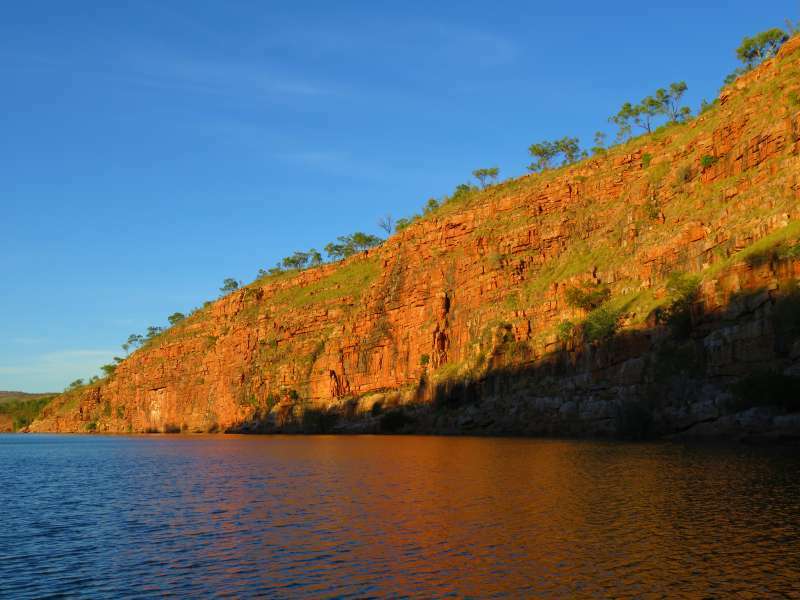 The Kimberley in Western Australia is one of the last true wilderness areas of the world. I wanted to go there forever. David was not so keen! Being a wilderness, the Kimberley is a little short on reasonably priced, mid-range to luxury accommodation - the kind we usually stay at. There are generally three types of travellers in the Kimberley. Those who pay a small fortune (think upwards of $2000 per night) to stay at an all inclusive resort, those who join a tour (all the tours involve camping) or those who have kitted themselves out with monstrous four-wheel drives. This last group sometimes camps and sometimes travels with an equally monstrous caravan. They have a rudimentary knowledge of how to fix things if they break down. They know how to pitch a tent, unhitch a caravan and cook on a campfire. They can ford rivers and 'lock diffs' (Does anyone know what that actually means?). None of these things are in our skill sets - and - David doesn't camp, full stop, end of story. He refuses even to contemplate the idea. Cue El Questro Station! El Questro Station is the poor (for 'poor' read 'affordable') relation to El Questro Homestead. El Questro Station campground is where the four-wheel drivers stay at the beginning, or end, of the famous Gibb River Road. There are literally hundreds of them there on any given day. However the Station also has bungalows - beautifully located motel-style rooms with ensuites and private balconies overlooking the river bank. 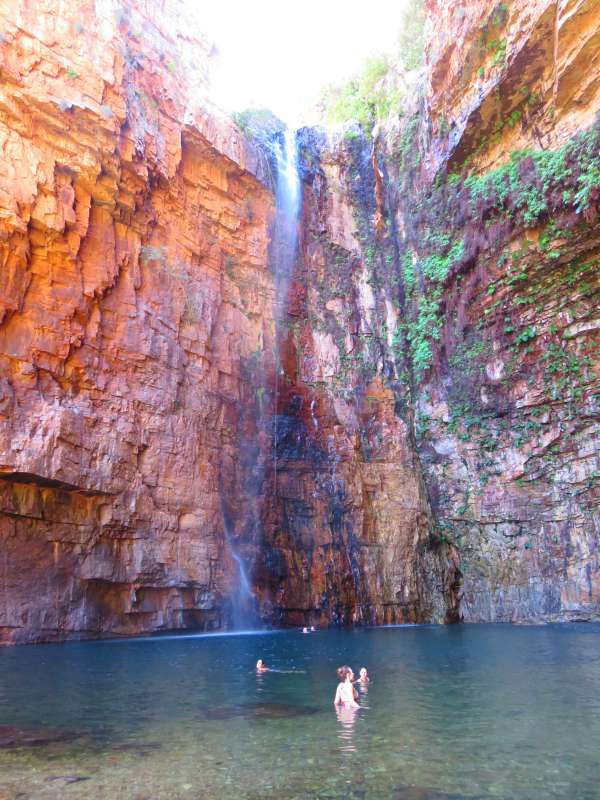 At around $400 per night, they aren't cheap and there are only a few of them, so you have to book before you are born, but they are without a doubt the best kept secret in the Kimberley and make the perfect base for exploring the sights of El Questro Wilderness Park. 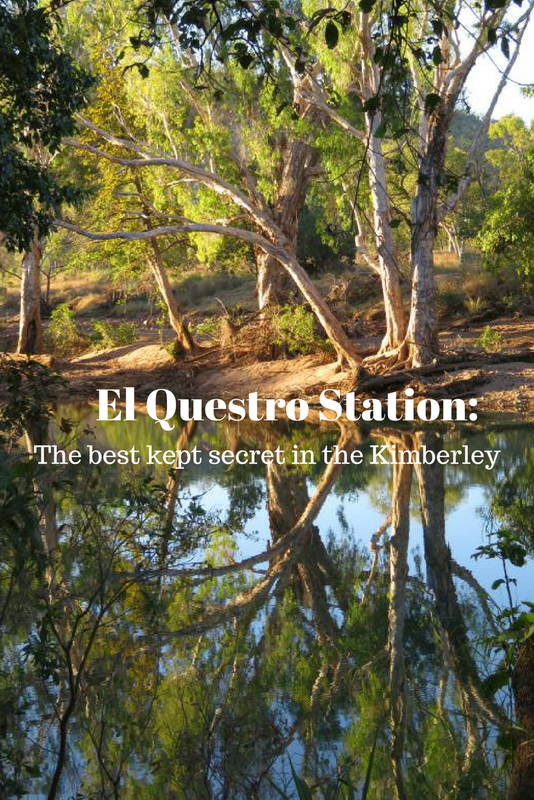 El Questro Station is an hour and a half from Kununurra by road. Kununurra, a town of less than 6,000 people, is in the middle of nowhere - but you can fly there from Darwin and Broome. I have a soft spot for outback towns and Kununurra is one of the best. Take my advice and spend a few days exploring the town and its surrounds before you head off to El Questro. How do you get to there? Hire a high clearance 4 wheel-drive. 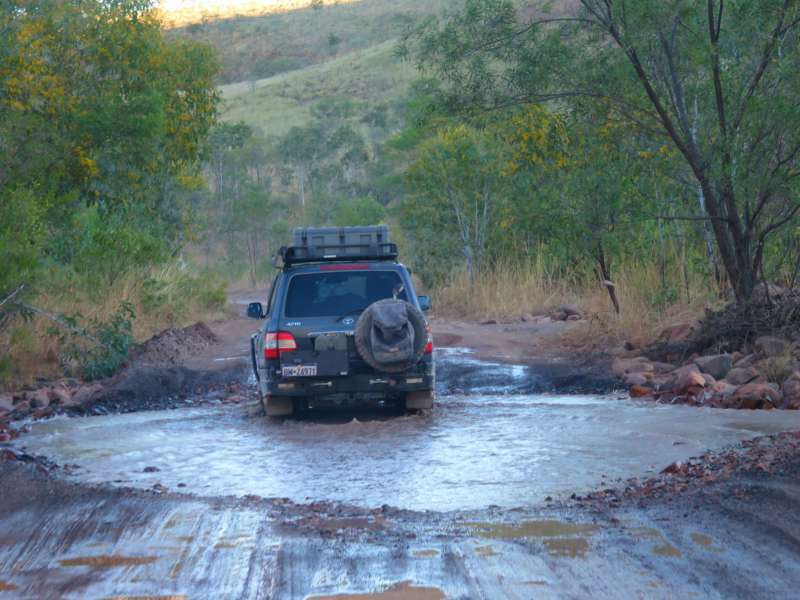 You cannot reach El Questro Station in a standard 2 wheel-drive car - unless you are lucky, or foolish, or both. Leave Kununurra heading toward Wyndham. Take the Great Northern Highway and then the Gibb River Road turn-off. 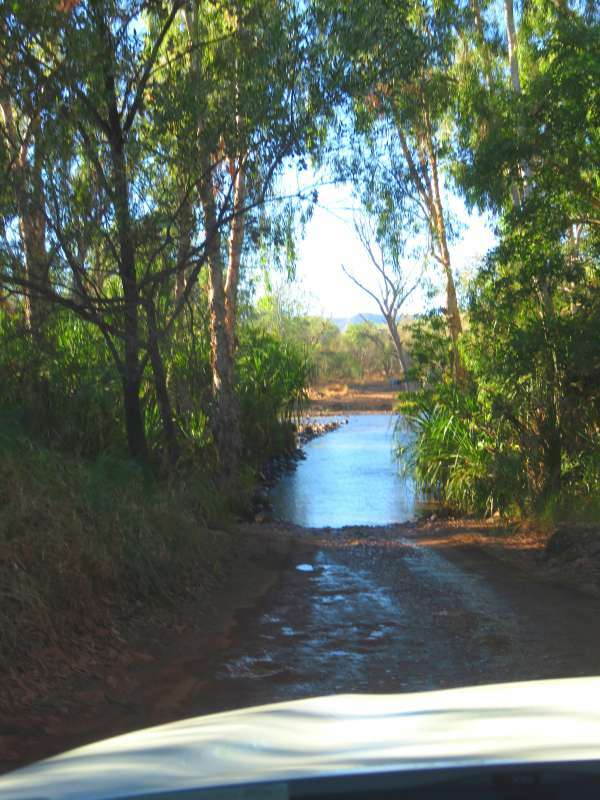 Don't panic, the Gibb River Road is sealed until just before the El Questro turn-off. After about 35 km you will see the turn-off to El Questro. There is a large sign. You can't miss it. The Station is another 16 km along a corrugated dirt road with a couple of small river crossings. Leave yourself plenty of time because it is slow going. 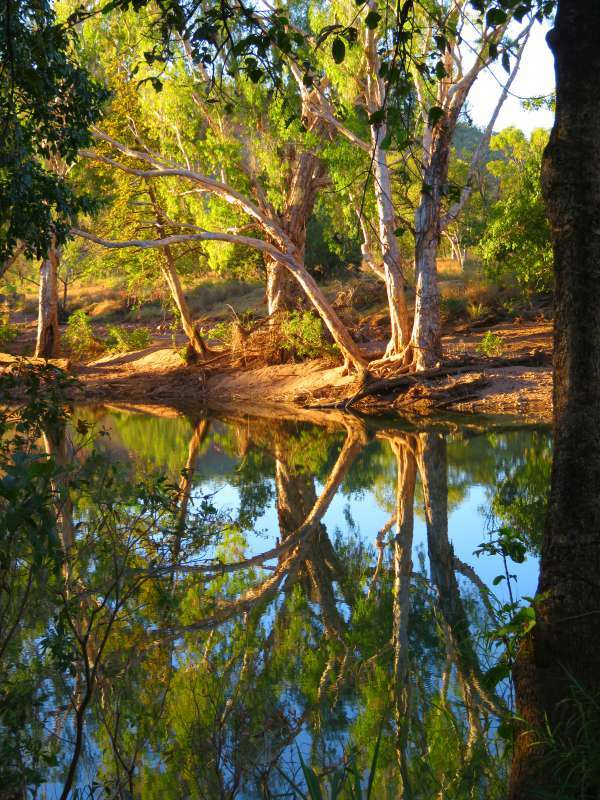 Just before you reach El Questro Station you will come to the Pentecost River. If you ignored my advice to hire a 4WD, you are allowed to panic here! I panicked and we had a 4WD. The river is wide with a rocky bottom but it wasn't more than a half a metre deep when we crossed. Engage the 4WD (don't bother about locking the diffs because I still don't know what that means) and enter the water slowly and steadily. Pray - if you think that might help. For what it is worth we crossed the Pentecost six times during our stay and didn't get stuck once. I would like to say that it got easier and less frightening with practice - but it didn't. Us about to cross the Pentecost River. You can see the car bonnet in the bottom of the photo. Or, you can always book a road transfer. 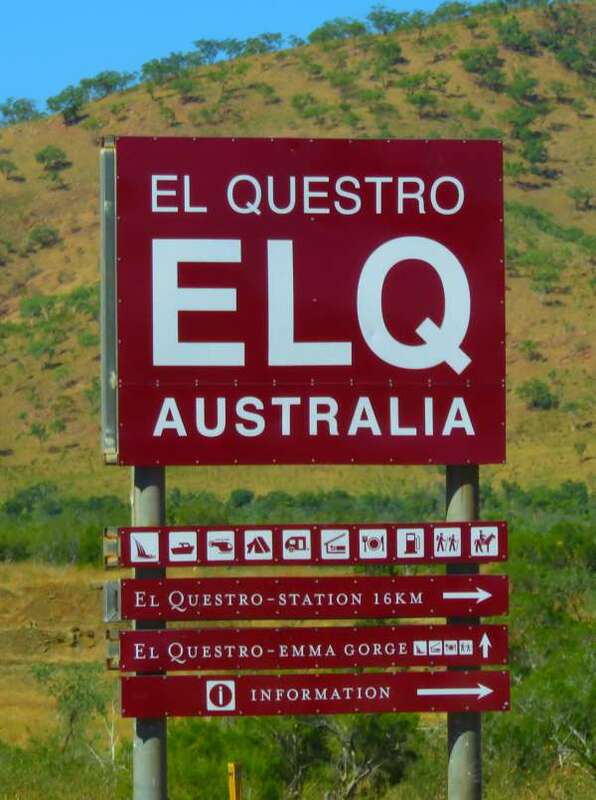 El Questro has twice daily road transfers from Kununurra. That way you get all the fun of the river crossings and none of the stress. Fly in. 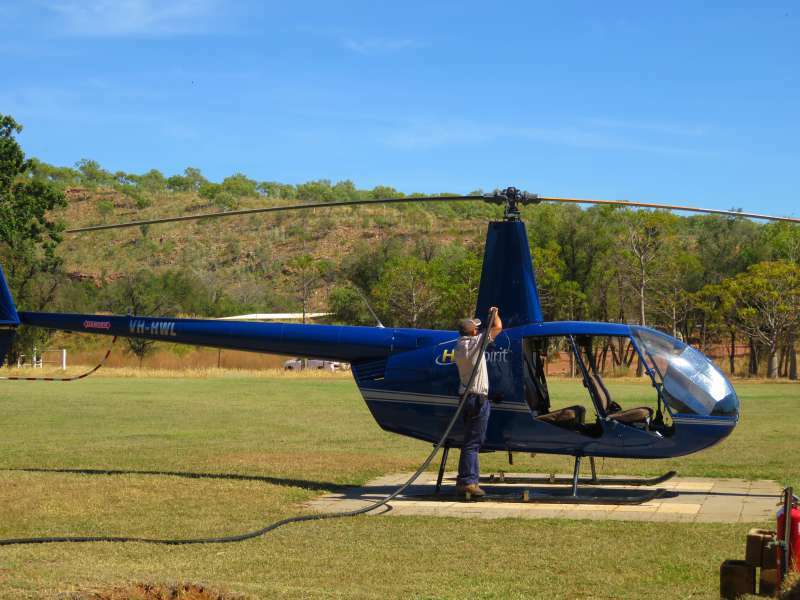 Small planes and helicopters fly in regularly from Kununurra. The bungalows are basic motel type rooms. Don't expect the kind of luxury you would get at the Homestead. 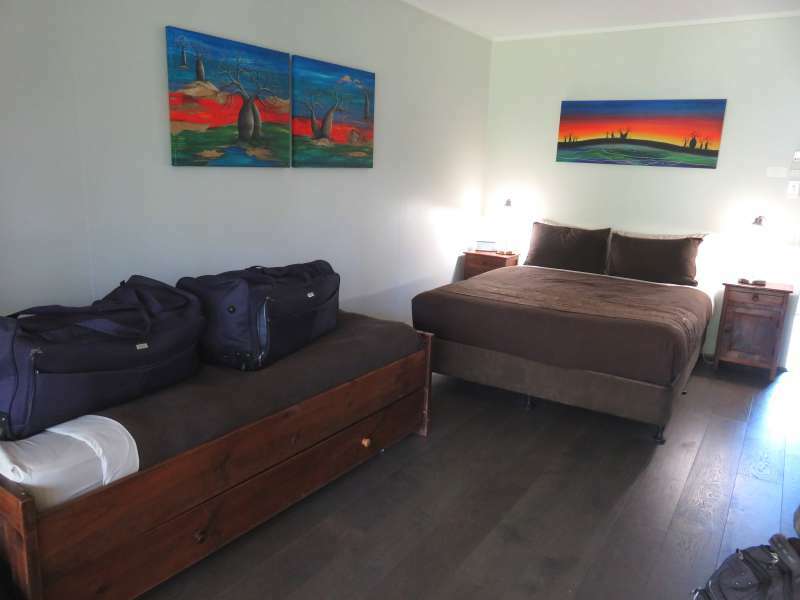 They are a reasonable size, have a comfortable bed, clean linen and towels and their own bathrooms. They are serviced daily. Our bungalow - not luxury but nicer than it appears in this photo. The riverside bungalows (E/F, G/H, I/J & K/L) are much nicer than the non-riverside ones. With private decks overlooking the water they are a great place to relax after a hard day's sightseeing. They are also far enough from the sometimes noisy bar area. Our private deck overlooking the river. The bungalows have no cooking facilites - not even a microwave - so you have to eat out. This means either the restaurant or the bar. We opted for the restaurant. It was more expensive than the bar but the atmosphere was lovely and the food was great. Do you need a car when you get there? No. If you have a serious 4WD there are tracks to explore. We didn't. We had a Mitsubishi Outlander which looked like a baby next to all the other vehicles. It got us to the station but was too small to handle the tracks once we were there. It wasn't a problem though. Many of the things we wanted to see were on the road back towards Kununurra and there were tours for those things we couldn't reach on our own. An ordinary two-wheel drive would struggle at El Questro. The station is within easy reach of several stunning gorges. We didn't visit all the gorges, notably missing El Questro Gorge and Explosion Hole. This is a list of those we visited and one we missed. Amalia Gorge is 15 minutes drive from the station, on the other side of the Pentecost River of course. It is about an hour's hike from the car park to the end of the gorge. For a review of Amalia Gorge read my blog post - Amalia Gorge: Would you go swimming with a crocodile? 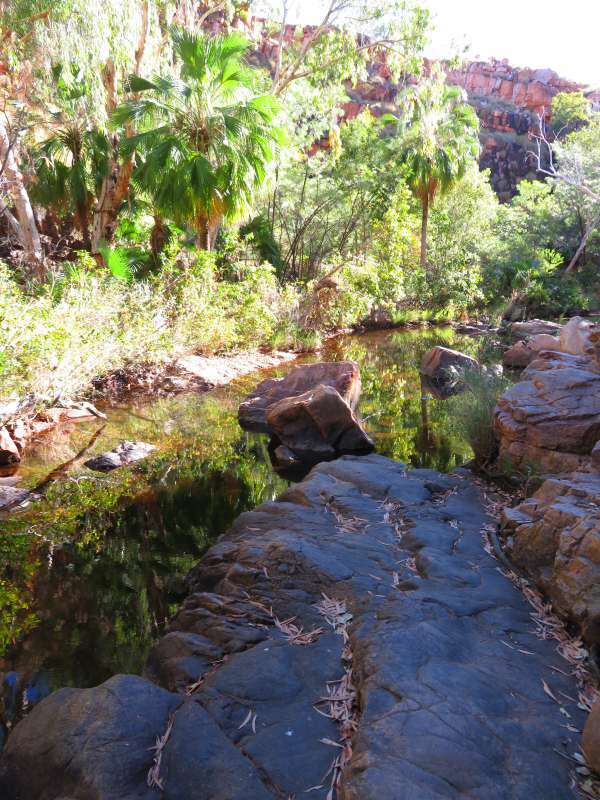 Emma Gorge is about halfway between the station and Kununurra. If you are coming from Kununurra it is worth calling in on the way. From the station it is an hour's drive.The hike from the car park takes about an hour. For a review of Emma Gorge read my blog post - Emma Gorge: There is something you need to know. Zebedee Springs is a bit less than 15 minutes drive; just before Amalia Gorge. The walk from the car park is an easy 1 km along a well-marked path. 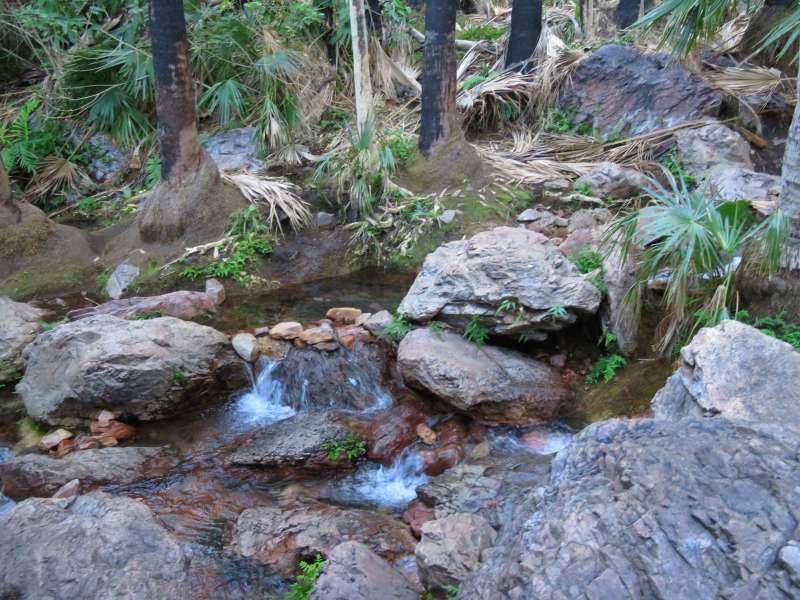 For a review of Zebedee Springs read my blog post - Zebedee Springs and Chamberlain Gorge: Disappointment in the Kimberley. We joined a boat tour to see Chamberlain Gorge. The tour is perfect for families, the old and the infirm, with no effort required. It was fun in a low-key kind of way. For a review of the Chamberlain Gorge boat tour read my blog post - Zebedee Springs and Chamberlain Gorge: Disappointment in the Kimberley. Partly because of its great name and partly because it was recommended to us by several people, we were very keen to see Explosion Hole. Small groups are taken to the hole in station vehicles and then join a boat tour - but it was not to be. Both the tour vehicle and the back-up vehicle had broken down on the day of our tour and we had no alternative but to join the much more sedate Chamberlain Gorge tour instead. For the full, sad story read my post - Zebedee Springs and Chamberlain Gorge: Disappointment in the Kimberley. On our last day at the station, we lashed out on a helicopter flightseeing tour. David nearly had heart failure when he saw the chopper had no doors. I have a much better head for heights than him but the safety briefing was enough to make anyone nervous. The pilot confiscated my hat (there was no way it was going to stay on), warned me to keep a firm hold of my camera with the strap secured around my wrist, and said something about the possibility of losing limbs if any part of our arms strayed outside the cabin. 'Don't lean out to take a photo', seemed to be quite important. The pilot was young, pleasant and cheery, delivering his warnings in a 'what could possibly go wrong kind of way'. The pilot filling the tank before our flight. Notice the absence of doors. I admit I was nervous about the chance my seat belt might come undone mid-flight. As it turned out it was the centrifugal force which kept us firmly in our seats, rather than the belt. Even when the helicopter banked and I was on the side staring stright down into the abyss I doubt I would have fallen out. I wasn't about to test it though. There was no way my fingers were going anywhere near that seat belt buckle. David spent the whole flight terrified. I loved it. He swore never to do anything like it again. Note: This is not a sponsored post. David and I paid the full cost of our stay at El Questro Station. The area looks stunning. You really have to be the outdoors type to do it affordably. I'm not up much for camping so I would have to do it your way. You and David would make a good pair. Although to be fair I might think I could camp but I probably wouldn't last long under canvas. It isn't easy visiting the more remote areas but so worth the effort. You have to book early. We booked about a year in advance. I loved Kununurra - to visit- not sure how I would go living there! This is high on my list of places to go! I hope you get there one day, I loved it. I have heard that some people make it through in two wheel drives but I wouldn't recommend it and it probably depends a bit on the time of year and how much water is in the rivers. Looks extraordinary. This one is extremely high on my list. I hope you get there. It is a great destination. David booked about a year in advance. Perhaps I exaggerated a little - lol! Many people miss the Kimberley when they come to Australia. It is a shame because it is a stunning place. It requires a fair bit of planning though. Next time you are in Oz I hope you get to Western Australia. Wow, no doors on the chopper. I've have been terrified on the ride too. But my wife Kelli probably would not have batted an eyelash, as she did skydiving once, jumping out of a plane thousands of feet up in the atmosphere. This looks like one of the world's last wilderness-style, true, pristine, wild places. I enjoy visiting such spots for at least a week or 2 before I need my creature comforts.....because I have to get away from the creatures in these outback spots, that cause quite a bit of discomfort, really. How about that mud pit too? Need 4 wheelers or nothing in this region, and even 4 wheel drive numbers do not guarantee you're cruising around thru the entire region because even these beast cars either break down or reach truly inaccessible areas. You are right about breaking down. The dirt roads David and I travelled on had enough other people around that we would not have been in danger but there are some roads in the remote parts of Western Australia that you could be in serious trouble if you broke down. A friend of mine did the Canning Stock Route (think middle of the desert) a few years ago in a convoy with another vehicle. They rented a satellite phone just in case. Fortunately they didn't need it. This looks like an amazing experience! I'm not sure I'll ever make it there so I'm happy to go along with you in your post. Thanks for sharing! Keep watching then. I have a few more Kimberley posts to go. Hi Lyn. This looks like quite the adventure! I can certainly relate to your comments about crossing the Pentecost River, as we had a smilier experience in the DR, and I was indeed praying that we would make it across! I love helicopter rides, but have never been in one without doors! You should try a helicopter without doors. It was a real blast. We went up in an R44 which is extremely common for sightseeing and a pilot once told me that the doors are very easy to remove for people who want the full 'wind in you hair' experience. We didn't take much of a risk. One day we might even go back and do the $2000 a night thing - but only for a couple of days - lol! What a great spot to get in touch with nature. I love the deck and would want to be riverside as well to enjoy the views. 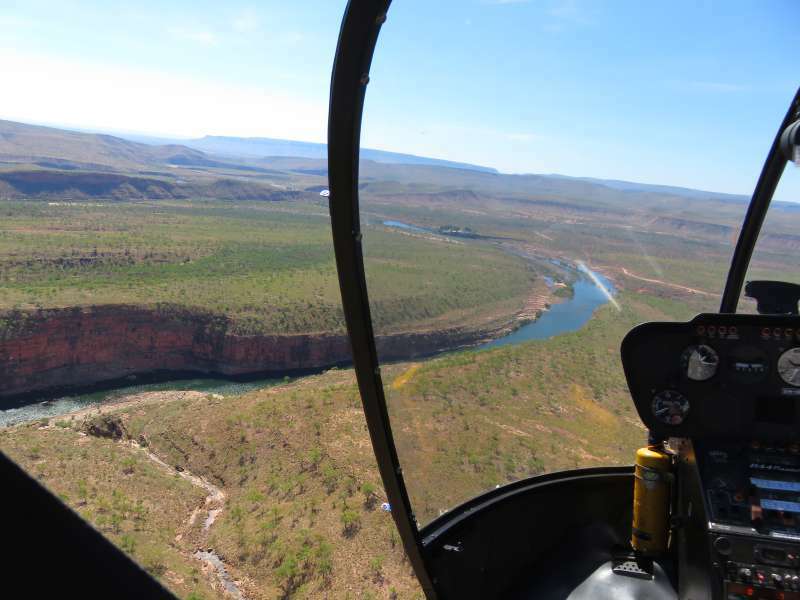 Helicopter sightseeing tours our one of our favorites! Thank you for introducing us to this fabulous place. If you like helicopter tours you should think about doing one in Sydney one day. Hovering over Sydney Harbour is one of the truly memorable experiences I have ever had. I loved your descriptions and I felt like I was there in the helicopter. I've no doubt I would be firmly in David's camp lol. We'd be the ones with the 4WD and caravan in tow! 'Doing' the Gibb River Road in a 4WD, with or without a caravan, is something of a right of passage in Australia for retirees and Baby Boomers. Staying at El Questro Station is as close as I will probably ever come but it did give me a taste of what it would be like. I always think I would be okay roughing it but when it comes to the crunch I'm not very good at it. What a beautiful area! I love those gorge photos. I would be terrified doing that helicopter too especially without doors. I'm sure the view from above is spectacular though. The view wasn't as great as I expected. I thought we would get closer to the gorges and waterfalls but the experience was still fantastic. What an adventure! I love your writing style, it always cracks me up! Too funny that your partner doesnt like to camp! I suppose me and my partner would be the ones with that monstrous 4wd as you described haha! And yeah, the heli not having doors would freak me out too! I am sure the monstrous 4WDs would be a lot of fun as long as you could pull into a 5 star hotel each evening - lol! The Kimberley looks fabulous but I don't do camping either! 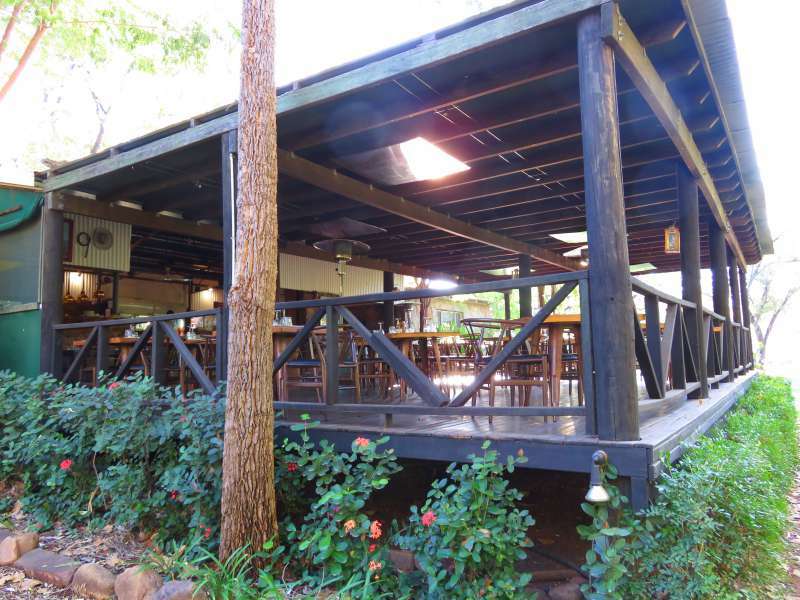 The El Questro bungalows seem like a great compromise. They were a great compromise. During the day we got all the atmosphere of camping but at night we had a comfortable bed. Now I'm really worried that I won't remember to "lock the diffs"----then what? My husband and yours are on the same page about camping. But, it looks like you found the next best thing----especially since you didn't have cooking facilities and were forced to eat every meal out. Haha - great comment. You started my day off with a laugh. What an exciting trip! I'd love to take a Helicopter sightseeing tour - but not so sure about no doors. I guess you're strapped in tightly though. The most surprising thing was that we just wore an ordinary lap/sash seat belt, the kind you have in cars. If I had been a total idiot I could have unbuckled it mid-flight with a flick of my hand. I think it was the centrifugal force holding us in rather than the belt, but I wasn't about to test that theory - lol!